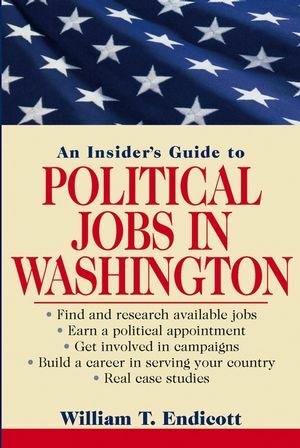 "Bill Endicott has written a remarkable description of what Washington political jobs entail, how you get them, and where they lead-a public service." "Public service is essential to our democracy. Bill Endicott's book . . . is the best primer I have read to help those interested in serving in our nation's capital. For those of us who have had the opportunity to work in political jobs, this experience benefits both the individual and the country." "A view of the process from the inside-from someone who's been there many times. No other source puts all the critical tips into one place as this book does. The perspective on the process is unique. The personal anecdotes and interviews are invaluable. We plan to recommend it to everyone who walks in the door hoping to find a job in politics." BILL ENDICOTT has served in political jobs for three decades. He worked for three congressmen, the Democratic National Committee, and the Clinton Administration, first as a political appointee and then as the Director of Research and Analysis in the White House Office of Political Affairs. He is a graduate of Harvard College and Harvard’s John F. Kennedy School of Government.